CONNECT with the "real world" outside of addiction, repairing relationships and managing the challenges of maintaining lifelong sobriety. 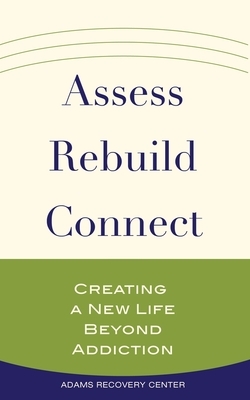 Based on decades of clinical experience, Assess, Rebuild, Connect is a down-to-earth tool for creating a new life beyond addiction--the life everyone deserves. Adams Recovery Center is a separate-gender drug and alcohol treatment program located in Ohio. ARC offers residential, intensive outpatient, and individual counseling services. The program is a modified Therapeutic Community running the Hazelden clinical curriculum. ARC uses the latest evidence-based practices and incorporates cognitive behavioral therapy, rational-emotive behavior therapy, and behavior therapy to maximize client gains in the program. ARC's previous books are Accept, Reflect, Commit: Your First Steps to Addiction Recovery and Addiction, Recovery, Change: A How-to Manual for Successfully Navigating Sobriety.